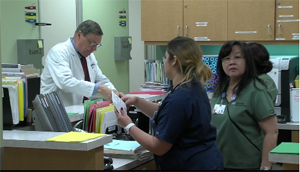 At 7 a.m. on Thursday, June 6, physicians and staff members at 29 primary care clinics began using CareConnect's full ambulatory functionality as it was rolled out in the first of four "waves" to all of UCLA Health's 150-plus patient-care clinics. Patients visiting the Wave 1a clinics on or after June 6 will also be given the opportunity to enroll in myUCLAhealth - CareConnect's online patient portal that enables patient to view portions of their medical records, see test results, request appointments, and communicate with their physicians' offices via secure email. Learn more about myUCLAhealth. As with all the clinics, those 29 in Wave 1a began with the March go-live using CareConnect for scheduling and registration; physicians used a special version of it called CareConnect Lite as a replacement for cView. From today forward, the nearly 200 physicians in Wave 1a outpatient practices will use CareConnect for all clinical work, including orders and documentation. Full ambulatory functionality will be implemented for the remaining outpatient practices in Waves 1b (July 11); Wave 2 (Sept. 26); Wave 3 (Nov. 14); and Wave 4 (February 2014). (View the schedule to see the clinics involved in each subsequent wave.) myUCLAhealth will also be offered to patients seen at outpatient practices as they go-live in their waves. Learn more about the Ambulatory Rollout.